Joao Mario has joined Inter Milan from Sporting Lisbon for £38.4m (45m euros), becoming the most expensive Portuguese player ever sold by a Portuguese club. The 23-year-old's move beats Sporting's sales of Cristiano Ronaldo (£12.24m) and Nani (£25m) to Manchester United. It is also the second-biggest move out of Portugal, marginally behind the fee Monaco paid Porto for Colombian James Rodriguez in 2013. Inter remain in talks over signing Brazilian Gabriel Barbosa from Santos. Erick Thohir, Inter's president, said: "Mario is a very important player, who we have followed for a long time and who would enforce an already competitive squad." 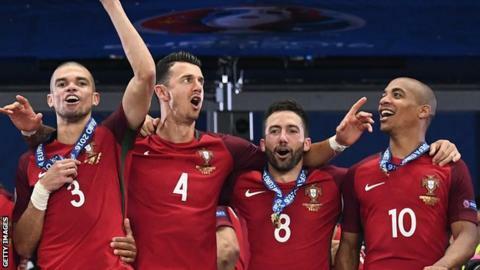 Midfielder Mario made 171 appearances for Sporting and played in every game of Portugal's Euro 2016 triumph, when they beat France 1-0 in the final.